Разработен е методически подход за оценка на качеството на ползваните учебни програми и значимостта на отделните теми в тях, с оглед потребностите за практическа реализация на обучаваните в професионално направление механизация и електрификация на селското стопанство и е направена оценка на значимостта на темите по учебни предмети: „Диагностика на агрегати и системи на автотракторна техника“ и „Съвременни методи и средства за техническо обслужване и текущ ремонт на автотракторна техника “. Получените резултати показват, че използването на методите на експертната оценка за определяне значимостта на отделните теми дава възможност за актуализиране на учебни програми в съответствие потребностите на пазара на труда. The theoretical fundamentals of the new technology water heating by thermal jet module were substantiated. Formulas for determining the energy parameters of the thermal module by heating the water were given. The main advantages and disadvantages of previously developed heat generators were shown. A design for a new thermal jet module with improved energy parameters and advanced capabilities of its use was created on the basis of theoretical research. A new developed structural and technological scheme of thermal jet module was given, which in comparison with analogues has advantages in improving energy performance . The proposed construction of a thermal jet unit has a scientific and technical novelty , enhances energy performance increasing the efficiency of the use of the cumulative effect of water heating by friction counter opposing layers of water of rotational and translational motion , friction forces of moving jets of water and air at different speeds , and heat transfer when exposed air to water with generated vacuum and cavitation. There are results the theoretical investigation of centrifugal dissipate the mineral fertilizers. It is made a mathematical model the centrifugal working devise. The unsteady of dissipate is defined at working width. The theoretical conclusion are confirm with experimental results. 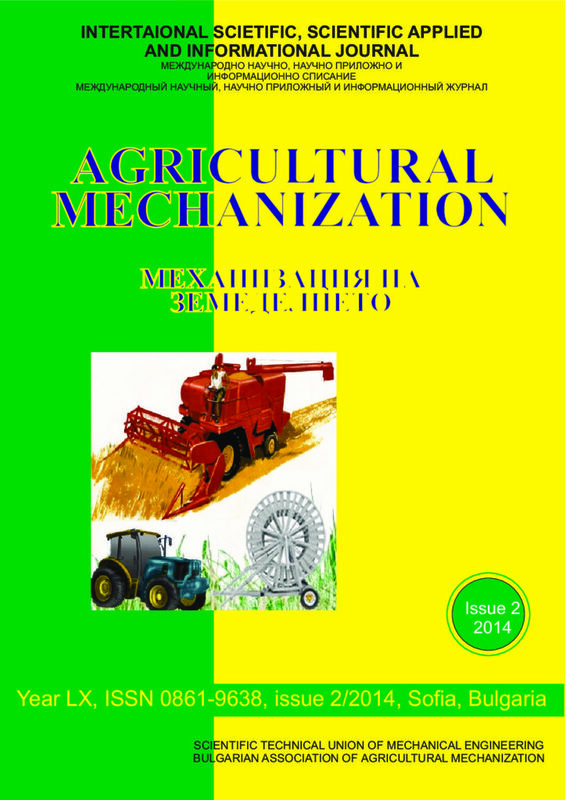 This paper present some of the current problems of theory and practice of agricultural science. The rational technology biotreatment of agricultural waste, including next operations: pre-preparation of raw materials, acid stage fermentation of the substrate and alkaline stage was developed. Advantage is manifested in the fact that in each phase are optimal conditions for the development and life activity of the microbial population, which is necessary to improve the efficiency of fermentation of biomass. The biogas plant with a double – chamber bioreactor was developed, scale tests conducted and their results were shown. A method of calculating the basic parameters of the technological equipment for processing waste were developed.